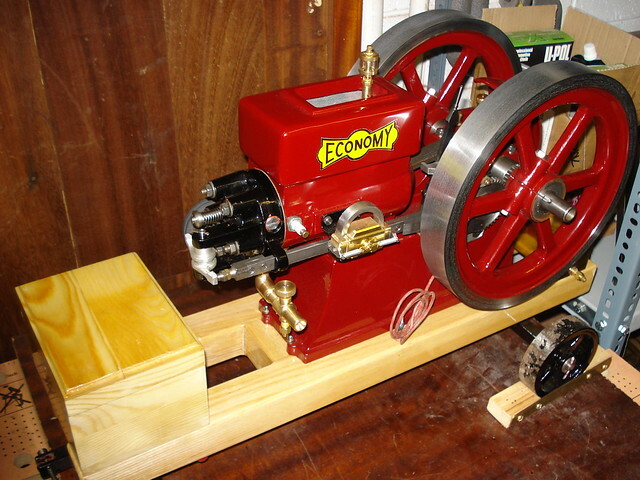 Almost two years ago I bought a dismantled Economy model engine from a widow. She told me that her late husband hadn't managed to get the engine to run properly and she remembered him starting to make a new piston for the engine. All of the castings are iron, it was just as well it was dismantled because it's too heavy for me to lift it when assembled! 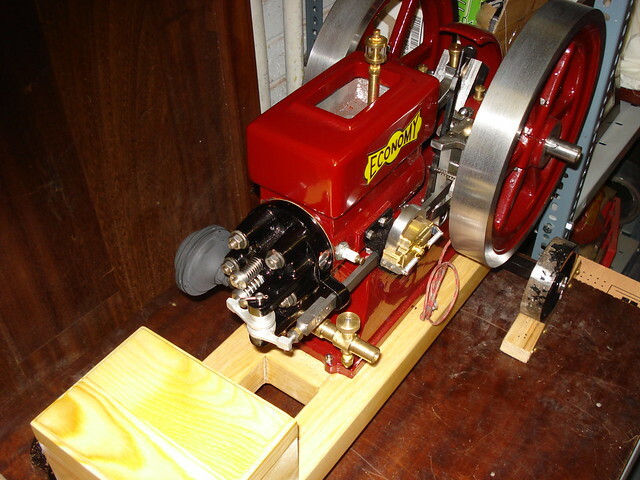 The engine came with the original plans and the box of parts was virtually complete. There was also a trolley for the engine with a nice set of cast iron wheels about 4" diameter. The aluminium piston looked as though it had seized or perhaps there was an alignment problem. There were no piston rings in the box, that might have told a story. However, the bore of the cylinder looked good, I wondered whether it had overheated or run with insufficient oil. 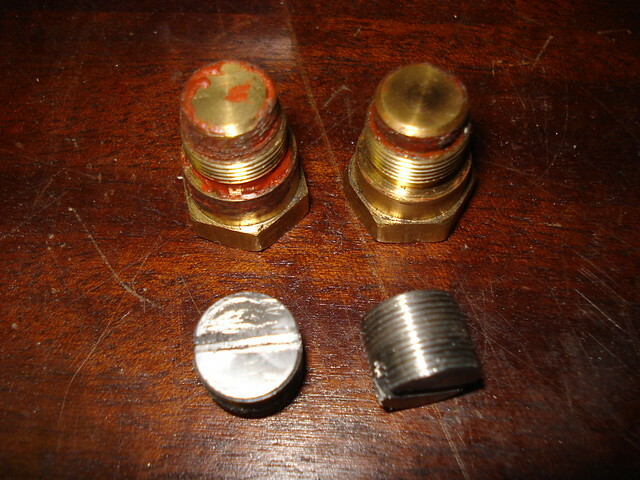 the clearance between the piston and cylinder appeared to be adequate. 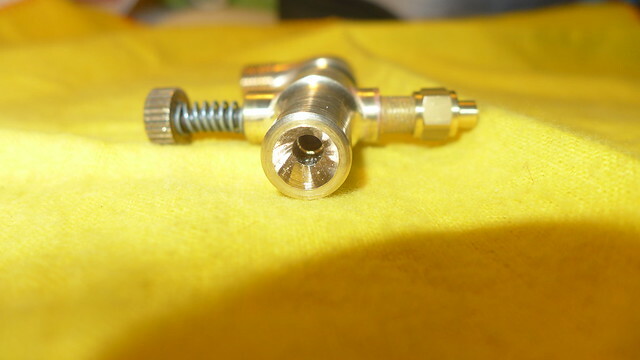 When assembled all the fitting was accurate and the running gear was nicely machined. My main concern was that the crankshaft was at a right angle to the cylinder, fortunately the alignment was perfect and everything turned over without binding. 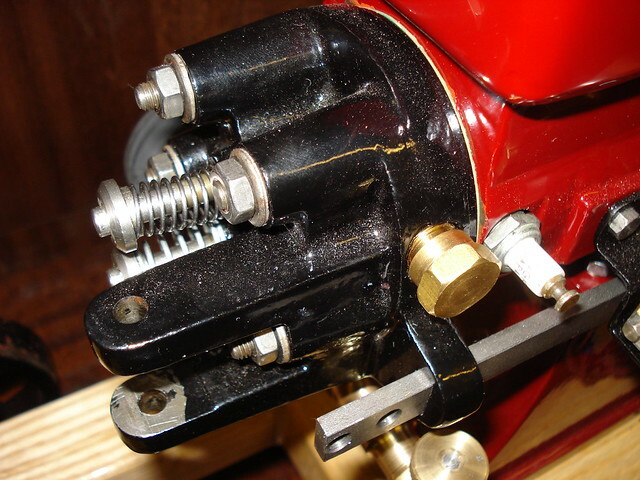 It seemed that most of my effort would be making a piston, piston rings, fettling the castings and cosmetic work. I had other models under construction so the Economy had to take a back seat. That is a fine looking engine Andy, and a large one at that! So where are you in the restoration? Obviously you have done a lot of looking and measuring and checking things out. Have you started on the new piston yet? Can't wait to see this one running and it seems like it won't take too much to get it there. Hi Bill, the Economy engine is coming along nicely, I'll add photos of my work. The first job was to hone the cylinder bore then make a new aluminium piston as specified in the plans. I milled out a deep slot in the end of an aluminium bar for the interior of the piston then transferred it to my lathe to complete the job - boring the inside of the piston skirt, machining the outside diameter and forming two piston ring grooves. 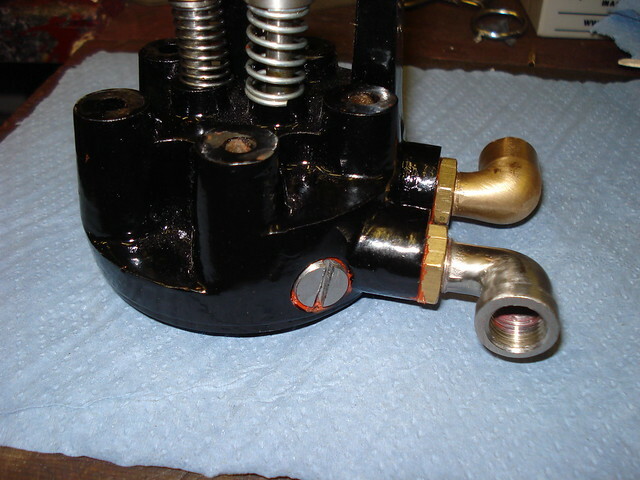 The completed piston was then parted off and mounted on a V block held in a 4 jaw chuck to bore the gudgeon pin hole. Meanwhile a good friend Ray turned down about eight inches of 3" cast iron bar to 2" for me to make 1.75" od piston rings. Could the problem be the grade of aluminium used for the piston picking up on the iron bore, or the rings a bit tight. In an ideal world would a cast iron piston be better? Maybe ithe wrong grade had been used Ian and I agree I could have used continuous cast iron bar to make a new piston as I have on my other engines. However, at the time I felt like a change from cast iron - easy to machine but such dirty stuff, and tried aluminium as specified by the plan. I don't know the grade of aluminium I used but the engine has run for a few hours and the piston looked fine when I took the engine apart for painting. I'll keep an eye on the aluminium piston, I can easily make an iron piston if necessary. I can't see from the pictures if there are any balance weights on the crank. Changing from a Al to a CI piston will more than double the weight and upset the balance. You want about 0.003" per inch dia clearance on the piston, well thats what I allow on an aluminium one in an iron bore. The photos is a bit out of focus but are the marks even all round or off to one side, if teh gudgeon pin in not square to the bore it may have twisted the piston sideways. Not seen a piston with that tapered type of skirt before. You're right Roger, I also reckoned a cast iron piston could make the engine more unbalanced. There are no balance weights on the crank. I tested the engine as soon as I had made a new piston and rings, when running at a low speed the engine was quite docile and stable. However, when the revs were increased it really danced about even when clamped to my hydraulic lifting table. This was not helped by the way the flywheels were machined. Whilst the outer rims were concentric with the hubs the inner rims hadn't been machined at all and were way out. I spent a lot of time trying to retrieve the situation but you can only do so much with a spoked flywheel that wasn't set up properly at the outset. The man that built the engine had a Myford Super 7 lathe so I suspect he had to get someone else to machine the 10.5" flywheels for him. 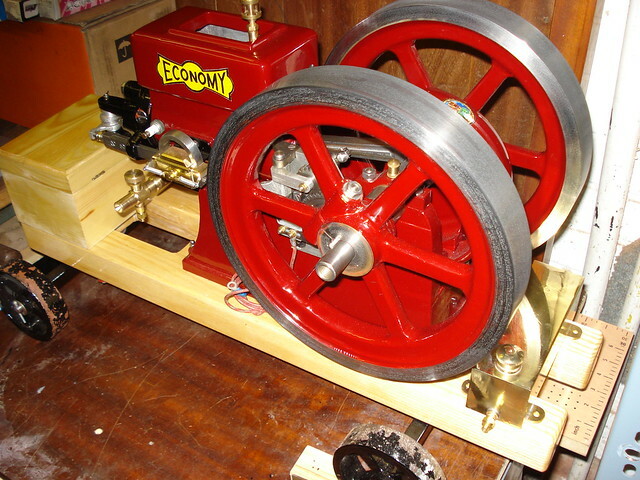 The workmanship on the flywheels was of a much lower quality than the rest. Hi Jason, yes that was indeed a poor picture, the damage was all round the piston. I was tempted to try cleaning it up but decided to make a new piston, it didn't take long. I don't remember the clearance I allowed but it seemed ok when I tested the engine. The conical piston skirt was new to me, it's in the plans. 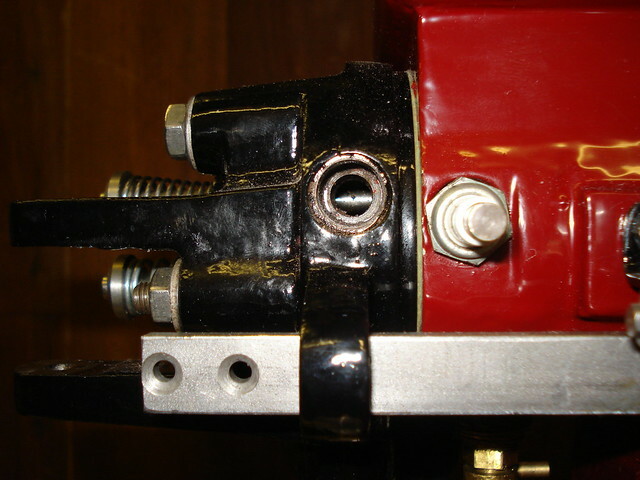 It was sufficient to allow for the connecting rod movement and might contribute to keeping the piston in shape. My friend Ray kindly spent some time turning down about eight inches of a 3" cast iron bar to 2" for me to make 1.625" od piston rings. After machining the od and boring out the centre I ground a very narrow tool so that I could part off as many rings as possible. Each ring was cracked open by placing it on a steel bar held in a vice then placing a knife blade against the ring and hitting the back of the blade with a small hammer. For heat treatment a nut was placed between the open ends of the ring which was then heated to red heat and left to cool. Each ring had just the right amount of 'spring'. The next task was to gently polish the rings using fine emery cloth on a surface plate until they were a sliding fit in the piston grooves. And finally the ends of the ring were filed to achieve the desired gap when fitted in the cylinder bore. The engine was reassembled with it's new piston and jury rigged for a test run. I couldn't get on with the carburettor that came with the engine so I borrowed the mixer from my Alyn Foundry RLE engine and the engine started easily and ran pretty well. You can also see how the inner rims of the flywheel are not concentric. Here's the engine running faster, much faster than I'd normally run this type of engine. I love the way it runs, Andy. I played the videos several times just to listen to it. Thanks for sharing. Cheers Rudy, I like to have the engine running as slow as possible. Here are a few video clips of the engine running on propane. 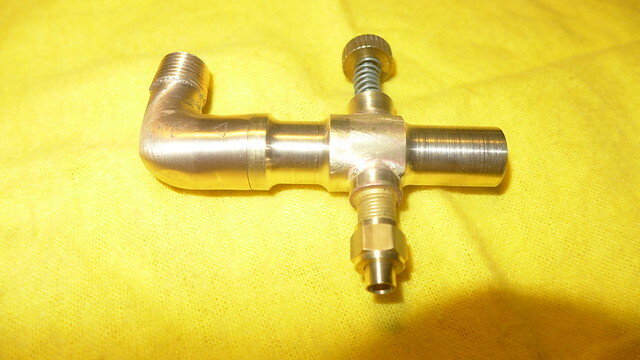 Didn't bother with a demand valve, simply connected up the gas supply with a rubber tube, set the pressure down to about 1 psi and she started quite easily. After some extended runs to satisfy myself that the engine was sound I took the engine apart for fettling and cosmetic treatment. The flywheels needed a lot of work. I have circled two holes in the picture below. These were a legacy of drilling a bolt hole through the clamp section of the flywheel. I think most builders wouldn't bother to drill such holes but it was very well done, the saw cut in the hub copied full size practice and it does facilitate tight fitting of the flywheels on the crankshaft. I wanted to fill the holes and make them inconspicuous. The machining marks left on the flywheel rims had to be sorted out, the inner rims needed machining and the spokes needed fettling. I cleaned up each hole in the flywheel rim with a 5/16" reamer then made tight fitting cast iron plugs threaded to accept a 2BA countersunk socket screw. The countersunk head overlapped the 5/16" hole and the screws pulled the cast iron plugs into the holes. I applied a copious amount of Loctite 638 to both screws and plugs. After the rim had been machined you could still see the plug if you looked for it but it was a big improvement on the holes. The person who carried out the machining of the flywheels failed to centralise the hubs and rims on their faceplate before boring out the hubs. I did the best I could to improve the appearance of the flywheels but decided I could replace them if they let the rest of the engine down. After extensive fettling using grinding points in a Dremel, I used Upol Dolphin Glaze car body filler to build up the surfaces for painting. Nice work Andy, that's a major improvement! Are you going to go after the rest of the engine in the same way? HI Dave, yes I have gone after the rest of the engine in the same way, lots of fettling and filling. There was no crank / splash guard fitted to the engine, I bought a new casting from the Engineers Emporium who were able to tell me that my engine, serial number 1334, was supplied as a set of castings in October 2008. You can see the surfaces of the castings in the pictures below, filling seemed the best way forward to me. I used Upol Dolphin Glaze car body filler all over the castings, it took a long time but I was pleased with the results. While the layers of primer and filler were drying I decided to improve on the silencer. The existing silencer was a steel pressing with a copper disc covering the opening. I liked the shape of the steel part so I machined a dome shaped cover from a piece of cast iron bar using a radius turning attachment. I did put spacers in between the two halves so the exhaust had a way out. In between coats of paint I made the dummy Webster magneto as set out in the plans. 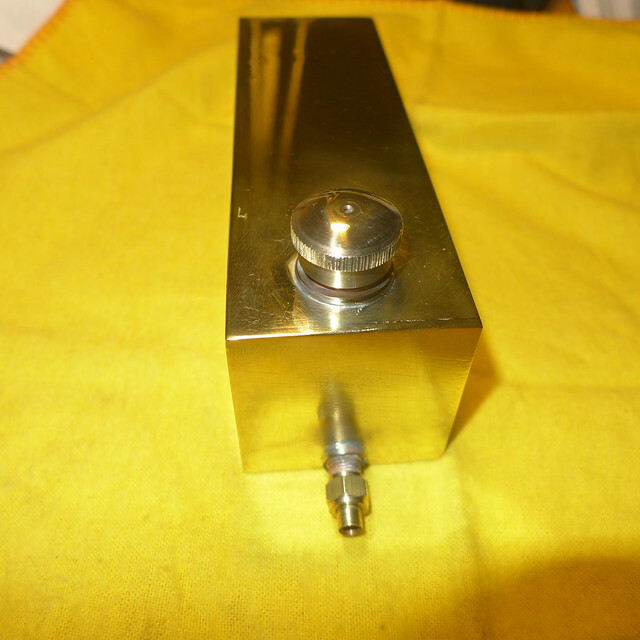 The main body came from a piece of brass bar milled to shape. I started to spray paint the model using a cheap (£18.00) HVLP spray gun that I had used for previous models. However, I kept getting a variety of defects in the paint finish. Even allowing for my lack of experience with spray guns I felt that the results were worse than I could achieve with an aerosol. So I blamed the cheap spray gun which gave me an excuse to buy a DeVilbiss SRi Pro Spot Repair Spray gun which gave far better results straight away using slightly thinned Craftmaster Crimson Lake enamel paint. Using a large cardboard box as a spray booth, I could get nice looking finishes but had a lot of problems with dust. I resorted to using cardboard boxes to cover the various parts while the paint dried and that made a big difference. That is a beautiful paint finish Andy. The whole project is coming together amazingly. What an impressive transformation!! Yes probably over the top, I had to satisfy myself that I could produce a high gloss finish. The downside is that I'm afraid of scratching it! Yes thanks Charlie. The dummy magneto consumed what seemed a disproportionate amount of time but it added interesting detail to the model. A steerable trolley is essential for moving this model around, it's rather heavy. The engine came with a trolley that was clearly intended to be temporary while the engine was under construction. The wheels and axles were fine, it just needed better woodwork to improve the appearance. Using Ash for a light colour, I made up a simple 'ladder' type chassis dowelled together and finished with Rustins Plastic Coating. Stainless steel thread inserts were screwed into the wood to take the studs that hold down the engine. Nice job on the engine Andy. I had trouble with the flywheel castings for mine, one of them has a buckle in it as if it was removed when still hot and layed against something. Had a hell of a jod to get it acceptable, but it will have to do now. Hope mine runs as well as yours ! Hello Martin, I have also read your build log as you go along and empathise with the flywheel issues. I note that the design of the flywheels have changed - the clamping bolt bits have been dispensed with. My build log is almost up to date I need to make a petrol tank and decide where to position it. It's supposed to be inside the base but I prefer mine to be accessible so its easy to drain when not in use. I reckon the original builder also had an issue with the castings in the main bearing department from what I could see of the way he machined it. Beautiful cart Andy and it just shows off that paint job even better. Very very nice!!! Yes it is all coming together nicely! The paint and wood work are beautiful. Thanks for that info Jason I'll have a go at making a removable jet and needle today. Here's a three minute video of my Economy engine running this afternoon. The focus isn't as sharp as I'd like, perhaps the light wasn't right. 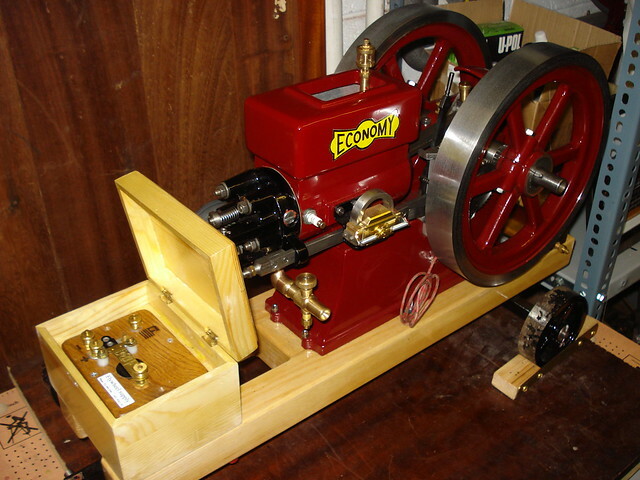 I haven't sorted out the mixer yet, the engine is using one borrowed from my Alyn Foundry RLE engine. It sure sounds good Andy!! Can you just make a copy of the mixer from the RLE engine to use on this one since it seems to work quite well on the Economy? The paint work is fantastic too!!! 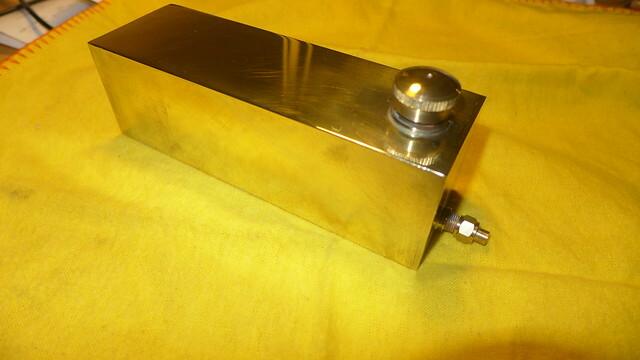 Hi Bill, I have to admit that I made a copy of the RLE mixer but it didn't function anywhere near as well as the original which I made about 20 years ago - must have been a fluke. Reckon the problem is making the needle, I'm thinking of using a gramophone needle for my next attempt.